The good folks over at Campus Reform report that leftist students at Hofstra University are demanding the college's administration take down a statue of founding father Thomas Jefferson because the statue represents a "legacy of racism and bigotry on college campuses." 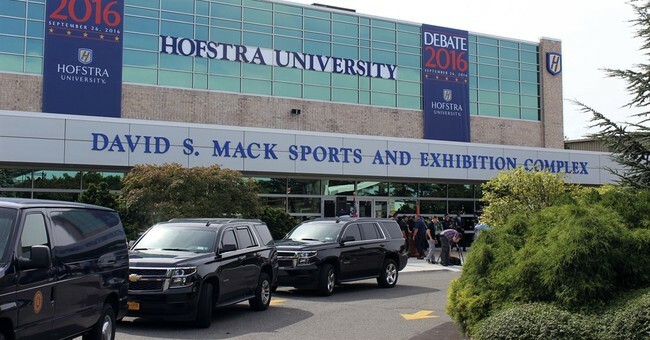 Campus Correspondent Sergei Kelley reports that Hofstra students held a second annual "Jefferson Has Gotta Go!" event on Friday. In addition to demanding that Jefferson's statue be torn down due to his slave-holding past, the group that gathered sought to ''expose the culture of bias and discrimination" found on college campuses. Who exactly put on this event? According to Kelley, "organizers included 'students of Hofstra University, staff from Planned Parenthood of Nassau County, and supporters of Hempstead community.'". The statue has been the target of controversy in the past, even eliciting white spray paint and other markings such as "Black Lives Matter!" stickers. Attempts by leftists to erase American history are nothing new. Progressives in Austin, TX recently wanted to rename an entire city because of Stephen Austin's view on slavery. As Professor James Robins, author of Erasing America: Losing Our Future by Destroying Our Past, warned in an op-ed from last summer, "Old-school liberals underestimate the ISIS-like desire of progressives to wipe out history that does not pass ideological muster. Stephen Austin’s views on slavery were complex and nuanced like [Thomas Jefferson]'s, but so what? He is tainted by the American Republic’s original sin, so for progressives that is case closed." Indeed, as evidenced by these leftist students and the organizations who support their cause, progressives will stop at nothing until statues and the historical prominence of even our founding fathers are removed from polite society. This occurs despite promises from people such as Hofstra's president to "create a task force 'to consider further dialogue and education about our founding fathers, the Atlantic slave trade and Western expansion; to think about what freedom and equality mean at the University.'"